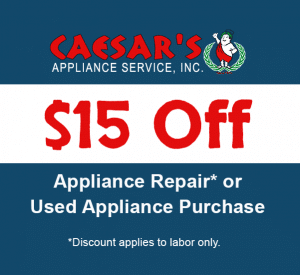 At Caesar’s Appliance Service, we’ve been providing fast, reliable appliance repair Orange County service since 1970. We come to you for in-home appliance repair throughout Orange County. Need Whirlpool washer repair in Irvine? We’ll be there! Looking for Sub-Zero refrigerator repair in Huntington Beach? We can do that too! We also serve customers from all over at our Orange County Used Appliance Store. Whether you need a used dishwasher, a used dryer or anything in between, visit Caesar’s for all your appliance needs! We even deliver throughout the County. Appliance Repair Service in Orange County, CA. Providing Refrigerator Repair Service, Washer & Dryer Repair Service, Oven Repair, Dishwasher Repair, Used Appliances, Appliance Parts, and More! Appliance Repair & Delivery Throughout Orange County, CA! Don’t put off your appliance repair needs! The longer you wait, the worse the problem may become. Call Caesar’s today to schedule service. We’re ready to provide every customer with 5-Star service! Whatever your appliance need, we’ve got you covered! Learn more about our Used Appliance Store and Appliance Parts Store.